This virtual reality demonstration looks at how 24 drugs (e.g. fentanyl, codeine, morphine) bind to the mu-opioid receptor. Many of these drugs are abused resulting in about 49,000 overdose deaths in the United States in 2017, about the same as the number of automobile fatalities. These 24 structures were determined by computationally docking the drugs to the receptor by a team at the FDA's Center for Drug Evaluation and Research to assess binding affinity and public risk. Experimental structures are not available for most of these bound drugs. Predicting opioid receptor binding affinity of pharmacologically unclassified designer substances using molecular docking. Ellis CR, Kruhlak NL, Kim MT, Hawkins EG, Stavitskaya L.
PLoS One. 2018 May 24;13(5):e0197734. doi: 10.1371/journal.pone.0197734. eCollection 2018. Get the opioid files opioids-vr-2018.zip. Use a computer with a virtual reality headset (e.g. Vive, Oculus Rift, Windows Mixed Reality) with SteamVR installed. Start ChimeraX. Use a version newer than October 7, 2018. Open data. Open start-opioids.cxc using the File / Open menu. In VR you will see the drug fentanyl in pink bound to the mu opioid receptor (from mouse, PDB 5c1m) in tan. Move. Hold the VR hand controller trigger button (index finger) to rotate and move the structure. Zoom. Hold both VR hand controller trigger and move hand together or apart to zoom. Button panel. Press the VR hand controller menu button to show a panel of buttons that switch between the 24 bound drugs. Move button panel. The button panel can be moved by holding down the hand controller menu button, and scaled by holding both hand controller menu buttons and moving hand together or apart. The mu opioid receptor is found at the synapses of neurons. The human body produces small molecules that bind to the mu opioid receptor as part of pain response: enkephalins, beta-endorphin and dynorphins. 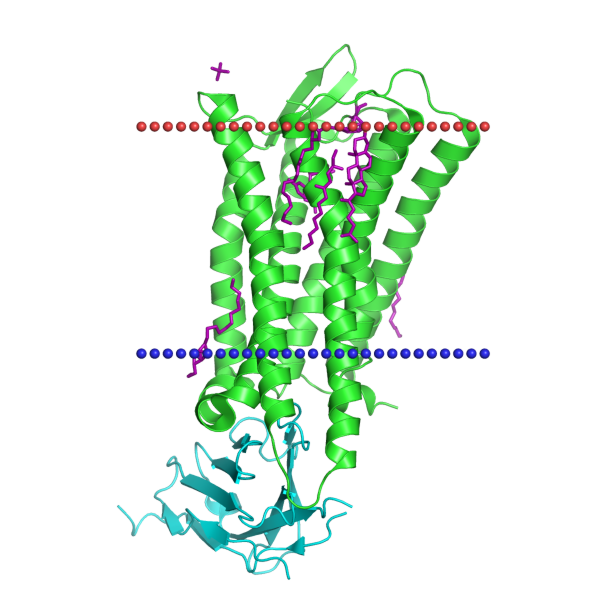 The receptor is embedded in the cell membrane with alpha helices crossing the membrane (between red and blue lines in image from OPM). Drug binding to the mu opioid receptor activates intracellular signaling pathways. The intracellular-side blue protein is an antibody fragment artificially used to mimic a G-protein to put the receptor in an active state. 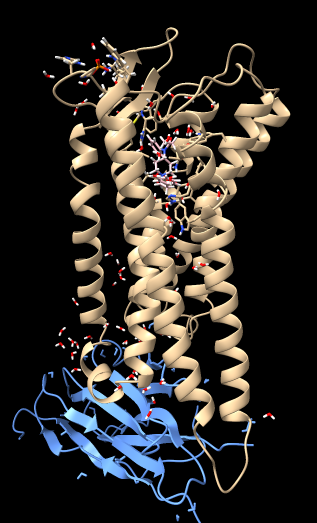 The receptor mu opioid receptor was determined by X-ray crystallography (PDB 5c1m) with agonist (drug) BU72. Some bound water molecules are shown in the structure.